The crisis of groundwater decline for the Ogallala region has been exacerbated by the rising cost of energy needed to pump water from the aquifer. In many wells and regions, the available water may be too deep to be pumped economically. Even in areas where the pumping depth is economical, geology limits pumping rates as the water table declines. 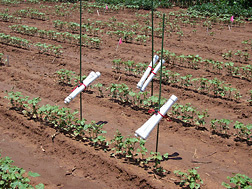 Cotton plots at the ARS lab in Bushland, Texas, are tested for water stress. The circles are placed around individual leaves, which were later cut for determination of leaf water potential, a key indicator of plant water stress. Relationships are determined between the leaf water potential, leaf temperature, and the multi-spectral measurements, which are useful in automating irrigation applications for efficient water use. The plot received the normal full irrigation amount. One promising new technology that ARS scientists are counting on to conserve Ogallala water is automating irrigation systems to precisely apply water only when needed, as determined by plant leaf temperatures. Susan O’Shaughnessy, an agricultural engineer in ARS’s Soil and Water Management Research Unit at Bushland, is making the time-temperature threshold (TTT) system wireless, so it can be commercialized. Steven Evett, a soil scientist there, advanced the TTT concept based on previous research from the ARS laboratory in Lubbock showing that each crop species is biologically programmed to grow best at certain temperatures—a narrow temperature window that varies from crop to crop. Until recently, TTT was suitable only as a research tool because of the long strands of wires needed to connect field infrared thermometers and those mounted on irrigation center pivot arms to computers. Now, O’Shaughnessy has 16 wireless infrared thermometer sensors mounted on the arm of a center pivot system that irrigated cotton this past season. She and colleagues developed the circuitry necessary to link the thermal sensors to commercially purchased wireless modules. Next, she will test improved wireless modules that will prevent data transmission interference. O’Shaughnessy is studying cotton because it’s a common crop in the southern Ogallala region. It needs less water than grain crops like corn, so it is more suited to an area like the Texas High Plains, where water supplies and rainfall are limited. O’Shaughnessy is also testing photo diode sensors that, by detecting reflected light, can help determine whether plants are stressed by lack of water or disease. They can also distinguish bare areas where no plants are growing. Eventually the photo diode sensors will be mounted alongside the thermal sensors on the center pivots. Soon O’Shaughnessy will expand the number of network sensors for another season’s tests. Ultimately, she and Evett will commercialize the system through a cooperative research and development agreement with a center pivot manufacturing company that can build the sensors into their equipment. Farmers use center pivots on 75 percent of the area’s irrigated acres. They use the more expensive drip irrigation on about 5 percent of the irrigated land. 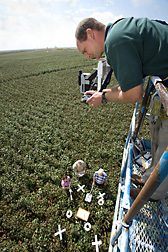 Technician Brice Ruthardt takes vertical images in the infrared and ordinary spectrums of cotton under water stress. Agricultural engineers Susan O’Shaughnessy (left) and Terry Howell (center) are taking multispectral measurements while soil scientist Steve Evett holds a reference target. “But the number of drip irrigation acres is growing as research points to its possible advantages in conserving Ogallala water,” says Paul Colaizzi, an agricultural engineer at Bushland. Colaizzi is working with Freddie Lamm, an agricultural engineer at Kansas State University’s Northwest Research-Extension Center at Colby, Kansas, to find the best irrigation systems and designs for each major crop in their locations. Colaizzi and Lamm are comparing subsurface drip irrigation (SDI)—buried irrigation lines—to two different center pivot overhead spray systems. He and Lamm have reviewed about a decade’s worth of data from experiments at Bushland; Halfway, Texas; and Colby. They found that, with deficit irrigation, sorghum yields with SDI were slightly higher than with center pivot, while with full irrigation, sorghum yields were slightly lower with SDI. Deficit irrigation uses less than optimal rates of irrigation water. 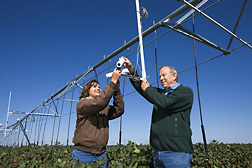 Agricultural engineers Susan O’Shaughnessy and Nolan Clark adjust the field of view for wireless infrared thermometers mounted on a center pivot irrigation system. The wireless sensors are used to measure crop canopy temperature for indications of water stress. Colaizzi and Lamm are experimenting with all design features of subsurface drip irrigation, from how far the lines are spaced to how deep they are placed and where they are placed in relation to the seedbed. Jim Bordovsky, an agricultural engineer with Texas AgriLife Research (formerly the Texas Agricultural Experiment Station), supplied Colaizzi and Lamm with 5 years of data from an experiment with drip-irrigated cotton at Halfway. Bordovsky’s experiment showed that the costs of switching to drip irrigation could be greatly reduced by relaxing design standards without affecting yields in any meaningful way. He tested three designs, from the strict standards of current recommendations to one with “greatly relaxed” standards. All got about the same yields. Their goal is to use less total water and still produce good yields. “We want to use the water more efficiently, but not just to spread it over more land. We want to actually lower the total amount of water pumped out of the aquifer,” Colaizzi says. 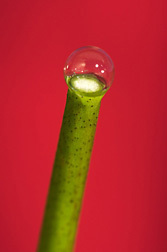 Sap bubble on the cut end of a cotton stem after leaf water potential was measured using the pressure chamber. ET is the total amount of water evaporated from plant leaves, including water taken in through plant roots, and water evaporated from soil. Gowda uses a scintillometer that employs laser light to measure the amount of turbulence caused by heat waves over crops. These are the wavy currents of air you see on hot days, especially over paved areas, but they also occur over plants and warm soil. These turbulent heat waves are a function of temperature and humidity fluctuations in the air. They’re also a measure of heat changes that help determine how much water the crops are using. The more turbulent the heat waves, the higher the water use. Once Gowda gets the scintillometer calibrated, he can use it to estimate the ET rate of any field, just by shooting laser light across the field to a target. He’s also looking at ET on the regional scale, using scintillometers to read over great distances. His plan is to calibrate the scintillometers with weighing lysimeters at Bushland and then install scintillometers at other sites over the Texas High Plains for ground-level estimates of plant ET, for comparison with satellite sensors that take regional readings. 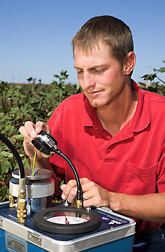 Using the pressure chamber technique (an industry standard), technician Chad Ford measures leaf water potential to determine water stress status of cotton plants. The measurements verify water stress at different crop canopy temperatures. ARS engineers want to eventually give farmers daily ET rates via the Internet, using a combination of scintillometers, satellite sensors, and remote-sensing computer models. Internet messages would be incorporated into bulletins currently issued daily via the Texas High Plains Evapotranspiration Network. The growing network has sites across the Southern and Northern High Plains of Texas to collect weather data to help farmers, urban landscapers, and others know more precisely the water-use amounts and rates for crops in the region. 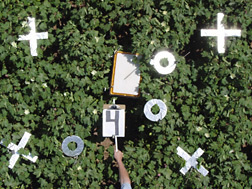 This network uses field weather stations and ARS crop water-use data to automatically send notices by fax and computer to advise when to turn their irrigation on and off. Terry A. Howell, research leader of the Soil and Water Management Research Unit, says his unit’s work will lead to adjustments in network recommendations, to account for regional differences in ET for each major crop. Howell is a member of the team that is building this network, which includes Texas state universities; Texas AgriLife Research at Amarillo, Lubbock, and Uvalde, Texas; and Texas AgriLife Extension. At Lubbock, about 100 miles south of Bushland, ARS plant physiologist Dennis Gitz is studying the recharge of the Ogallala Aquifer from playa lakes. He has found that water moves continually, if very slowly, below these ephemeral lakes that form when water drains into natural depressions lined with clay soils. This water flows from the bottom of the lakes slowly into the Ogallala, contributing to its recharge. About 22,000 to 40,000 playa lakes dot the Southern High Plains, which includes the Texas Panhandle and part of neighboring New Mexico. They vary in size from 10 to 100 acres, with most around 10 to 30 acres. 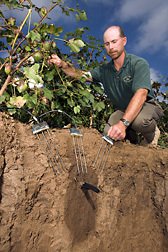 In related work, Gitz uses soil thermometers to see whether rainwater is seeping past the crop root zone. “Once the water gets below the reach of plant roots, it can only go down until it hits groundwater,” he says. The thermometers detect the sudden change in temperature that occurs at the point where rainwater stops seeping. Soil becomes either warmer or cooler, depending on conditions. With colleagues from Texas Tech University, Gitz proved the thermometer idea works in a study that showed a good agreement between thermometer readings and actual water-infiltration readings. Soil thermometers are a much less expensive way to determine the reach of rainwater. The scientists see the temperature gauges as an important tool for measuring the recharge rate of the Ogallala Aquifer from playas and perhaps other sources. Wireless infrared thermometers continuously measure plant temperature as part of the BIOTIC irrigation scheduling method. Gitz has installed a bank of instruments at 14 playas and is developing instruments for 16 more. These include instruments for weather stations, as well as for measuring water levels. Data from these instruments will be used to calculate expected water evaporation rates and then compare them to actual water losses. The difference between total water loss and evaporative water loss gives the loss from soil infiltration. The recharge rate for the Ogallala Aquifer is considered negligible in cropped areas, where rainfall usually reaches only 2 to 3 feet below the ground surface and crop root zones extend deeper—to about 6 feet in the case of corn. “But we want to see if this holds true for playas—or whether some or all of these lakes have higher recharge rates than nonplaya areas,” says Gitz. ARS plant physiologist James Mahan, also at Lubbock, is one of the original theorists of the preferred temperature ranges of plants and using them as the basis for knowing when to irrigate. He and colleagues packaged a system called “BIOTIC” that was recently licensed to the company SMART CROP for commercial production. Mahan sees BIOTIC helping the world deal with the new reality of water-deficit management. “Water has become the major cost in farming the Ogallala region,” he says. Jeff Johnson, an economist at Texas Tech, and colleagues at Kansas State University, West Texas A&M University, and Texas AgriLife Extension—all involved in the Ogallala Aquifer Program—have done a modeling simulation to see what would happen to the southern part of the aquifer over the next 60 years under various scenarios. Using 91 counties for the simulation, they found that with no policy changes, the average saturated thickness of the aquifer in its southern part would decline by almost half. Most farmers would stop irrigating, and income per acre would drop by nearly half. In a smaller follow-up study, Johnson and colleagues found that switching from irrigating to livestock grazing could change the economics more favorably, since growing pasture for grazing was more profitable than growing other nonirrigated crops. The Texas Tech University scientists plan to continue using the models developed in their study to evaluate the consequences, county by county, of implementing various policy changes—such as taking land out of irrigation, at least temporarily. “We will include scenarios in which incentives are also offered for water-conservation practices and planting water-conserving crop varieties, including those developed through biotechnology,” Johnson says. “Big Spring, another 100 miles south of Lubbock, has very limited well capacity, so we figured this would be a good place to test ways to make better use of the rain,” says Scott Van Pelt. A soil scientist in the ARS Wind Erosion and Water Conservation Research Unit there, he’s found that applying small amounts of irrigation water most of the year can increase cotton yields. Learning to wisely use and manage water is the only option for sustaining the rural economy of the Ogallala Aquifer region, one that is vital to the U.S. economy and its food supply.—By Don Comis, Agricultural Research Service Information Staff. This research is part of Water Availability and Watershed Management, an ARS national program (#211) described on the World Wide Web at www.nps.ars.usda.gov. To reach scientists mentioned in this article, contact Don Comis, USDA-ARS Information Staff, 5601 Sunnyside Ave., Beltsville, MD 20705-5129; phone (301) 504-1625, fax (301) 504-1486. "The Ogallala: Gauging, Protecting the Aquifer’s Health" was published in the April 2008 issue of Agricultural Research magazine.